Are The Cream Of The Crop!" when our class was assigned. then decided to make it look 3-d.
corn and then painted it. came from the Mailbox magazine. First you paint your styrofoam cup brown. Then glue on your turkeys face and feathers. Quick, easy, and fun Thanksgiving display! Before we created the turkeys we of course learned about them! This bulletin board I made for inside our classroom. of what her class did for their bb this year. 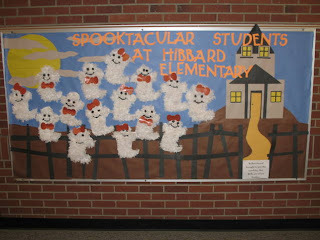 Adorable Bulletin Board. What did you use to make the ghosts?